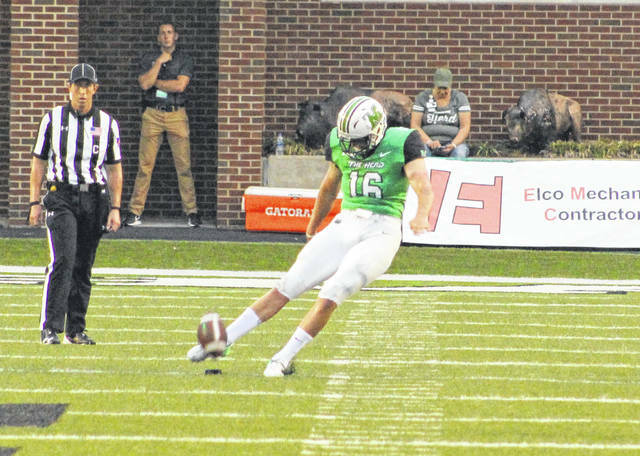 Marshall kicker Justin Rohrwasser (16) puts a boot on the ball during a Sept. 8 football game against Eastern Kentucky at Joan C. Edwards Stadium in Huntington, W.Va. BOWLING GREEN, Ky. — It took all night, but the Herd finally got over the Hilltoppers. Tyre Brady hauled in 32-yard touchdown pass with 1:44 left in regulation, then Juwon Young recovered a red zone fumble with 10 seconds remaining as Marshall held on to claim a 20-17 victory over host Western Kentucky on Saturday in the Conference USA opener for both programs at L.T. Smith Stadium in the Bluegrass State. The Thundering Herd (3-1, 1-0 C-USA East) churned out 401 yards of total offense and held the first leads of each half, but four turnovers allowed the Hilltoppers (1-4, 0-1) enough opportunities to make things interesting over the course of the 60-minute battle. Tied at 10 entering the fourth, MU strung together an 11-play, 51-yard drive that led to a successful 21-yard field goal by Justin Rohrwasser — giving the Green and White a 13-10 edge with 8:39 left in regulation. Marshall’s Nazeeh Johnson came up with an interception on the Hilltoppers’ following drive, but DeAndre Farris countered with an interception on the Herd’s next possession. Farris returned the Isaiah Green pick 47 yards to the MU 11, setting up a first down for the hosts. WKU needed only one play to cover the distance as Mik’Quan Deane hauled in an 11-yard pass from Steven Duncan, giving the Red and White a 17-13 cushion with 6:50 remaining. MU had its next drive stall with a Masai Whyte interception, but the hosts were forced to punt the ball away on their ensuing drive — which gave the Herd possession at their own two with 4:23 left. The Thundering Herd were forced to convert a pair of third down plays along the way, but the guests made the second of those pivotal plays worthwhile as Brady pulled in a 32-yard grab from Green at the 1:44 mark. The drive covered 98 yards in seven plays, allowing the Green and White to secure a 20-17 advantage. WKU started its final drive at the 25, then marched 65 yards in four plays to set up a first-and-goal at the 10. After two plays and no luck, the Hilltoppers chose to go to the air on third down at the 10. Ryan Bee rushed in and sacked Duncan, but Duncan also lost control of the ball on the way down to the ground. Young swooped in and scooped up the fumble at the 10, allowing MU to take over on downs with 24 seconds left. Green took the final snap and went to a knee to run the clock out, giving Marshall the hard-fought three-point victory. Brady gave the guests a 7-0 lead on Marshall’s second drive of the game, hauling in a 40-yard pass from Green at the 9:48 mark of the first period. The Hilltoppers answered with a 23-yard field goal by Ryan Nuss with five seconds remaining in the opening canto, making it a 7-3 contest. WKU took its first lead of the game with 4:38 remaining in the half as Duncan capped a seven-play, 75-yard scoring drive with a three-yard run en route to a 10-7 edge. Marshall, however, put together a six-play, 38-yard drive that resulted in a successful Rohrwasser field goal from 21 yards out, making it a 10-all contest with 36 seconds remaining until halftime. The Thundering Herd claimed a 401-324 advantage in total yards of offense, which included a sizable 113-61 edge in rushing yards. Both teams produced 17 first downs apiece, and WKU ended the game plus-1 in turnover differential. Keion Davis led Marshall with 65 rushing yards on 16 carries, followed by Tyler King with 42 yards on eight totes. Green ran for 13 yards on six carries and also completed 18-of-39 passes for 288 yards, including two TDs and three interceptions. Brady hauled in a game-high eight catches for 162 yards and two scores. Obi Obialo was next with four grabs for 80 yards. Rohrwasser was also 2-for-2 on PAT kicks and went 2-for-3 on field goals, with the miss coming on a blocked 33-yarder in the third quarter. Brandon Drayton led the MU defense with seven tackles, while Bee recorded half of Marshall’s four sacks. The guests also recorded a total of 11 tackles for loss. Young and Frankie Hernandez also recovered a fumble each. Joshua Samuel paced the WKU rushing attack with 43 yards on 10 attempts, followed by Duncan with 12 yards on 15 totes. Duncan was also 24-of-39 passing for 263 yards, throwing one pick and one score. Lucky Jackson led the Hilltopper wideouts with five catches for 41 yards. Quin Jernighan also hauled in five passes for 39 yards, while Kyle Fourtenbary caught five passes for 33 yards. Devon Key, Ben Holt and Masai Whyte led the WKU defense with seven tackles apiece. Whyte, Farris and Ta’Corian Darden had an interception apiece, while Jeremy Darvin recovered a fumble. Marshall’s last win at Bowling Green came in 1950 by a 47-13 margin. The Herd now leads the all-time series with WKU by a 6-4 overall margin. The Herd returns to Conference USA action on Friday night when they host Middle Tennessee State for a 7:30 p.m. kickoff.